When you went to look at the rental or sale property, it was probably immaculately clean. Once you signed the dotted line though, the real estate agent probably didn’t do more than run a broom across the floor. So don’t be surprised if your new home is in bad shape when you come to move in. Ideally, you should come over to the new home before moving day to clean it. This includes making any minor repairs, painting, changing the toilet seat, or having an exterminator come over. But, it isn’t always possible to access your new home before moving day. Here is how you can get your new home clean after moving in. If you are moving long distance and won’t be able to come to the new home before moving day, consider hiring a professional cleaner to come over instead. 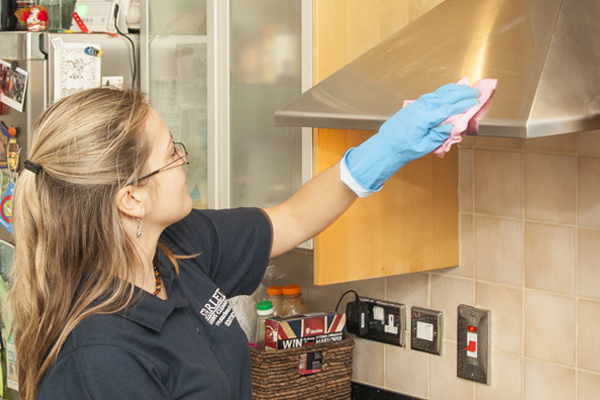 You can arrange for the landlord or real estate agent to let the cleaner in. Since you won’t be able to check the work, request that the cleaner take before/after pictures so you know what condition to expect. It is a good idea to make a furniture plan for your new home because it ensures that all your furniture will fit in the space. But the plan can also help you clean efficiently. When you know where all the furniture is going to go, you can quickly come in before the movers unload the big items to sweep up the floor (it will be a lot harder to clean the floor once the furniture is there!). When you move, the first instinct is to start tearing open boxes. But take a few moments to sweep floors, vacuum, and wipe down shelves before your belongings are cluttered everywhere. Once you start unpacking, chances are you won’t bother to clean anything. In each room, designate an area for boxes to be stacked until they are unpacked. The closet is generally a good place to stack the boxes. With all the boxes confined to one area, it will be easier to clean up around them. You should always pack a box of essential items (i.e. “Survival Box”) that you will need for the last few days in your old place, and the first few days in your new place. Make sure this survival box includes some basic cleaning supplies. The survival box should be put on the moving truck last so it can be unpacked first. Remember to label it clearly!